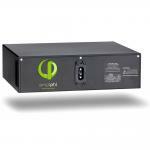 OutBack inverters mount on a unique hinged door to keep the footprint of the system as small as possible. They come standard with left-hand hinge, allowing the charge controller to mount on the right. 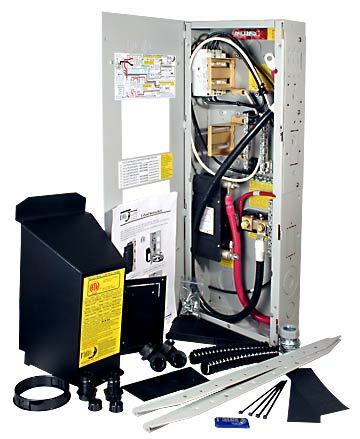 The STS version leaves room for the OutBack AC box with a surge arrestor for grid-tie applications and the AL-PLUS version has room to mount an inverter and MX60 on the door. Mounting brackets are included to aid in one-person installations. Main breaker, inverters cables, a 500-amp/50mv shunt for battery monitoring systems, 175-amp AC-power distribution block, 50-amp AC-input disconnect for generator or utility, 50-amp AC bypass switch are included and pre-wired. They come with a mounting bracket for an OutBack MX60. Cutouts for mounting up to six additional 13mm-wide DIN rail mount breakers are provided as well as a cutout for a GFCI-style AC outlet. 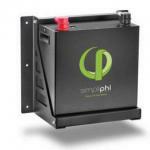 For help in choosing the correct Epanel for a particular inverter please view Epanel Matrix Chart below.